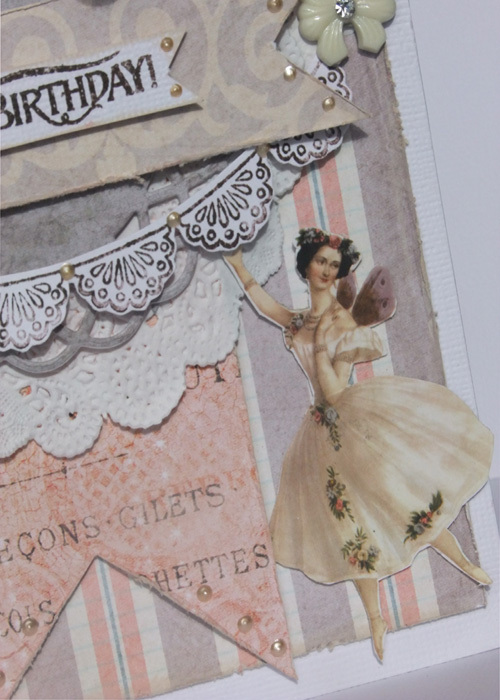 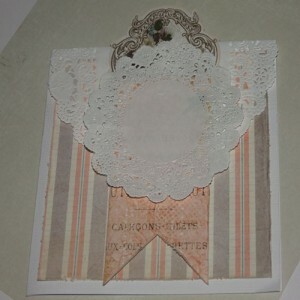 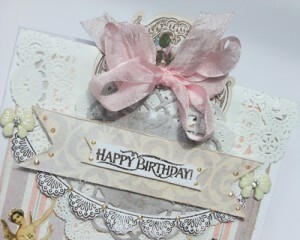 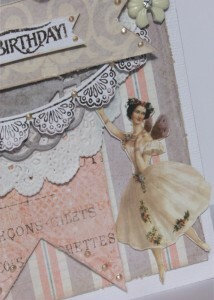 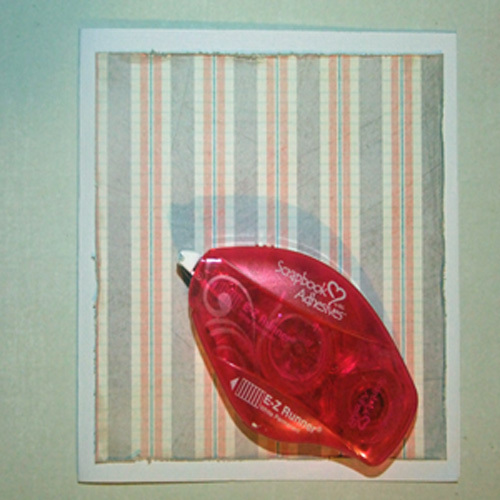 Shell Carman here today to share a tutorial on making a layered shabby chic Birthday Card! 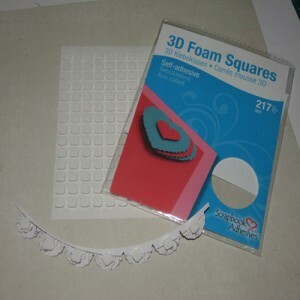 I have chosen some girly papers & products with the idea of making a pretty card for a young girl. 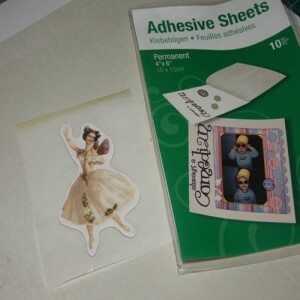 I am using Prima Fairy Belle collection with a collection of Scrapbook Adhesives by 3L! Start by cutting a piece 6″X12″ from white cardstock & fold in half so that you have a 6X6″ square card base. Cut Fairy Belle in Firefely 5.5X5.5″ & distress & ink the edges. Run the E-Z Runner Permanent Strips Refillable around the edges of the firefly piece & stick to white card base. 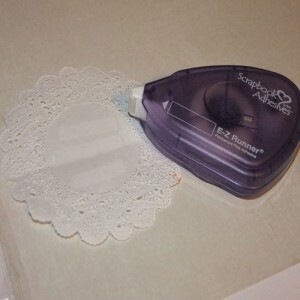 Use a Medium size White doily. Apply E-Z Runner Permanent Fine Adhesive to half of the doily. 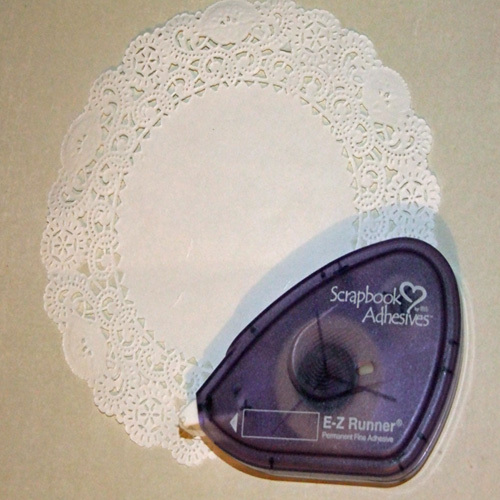 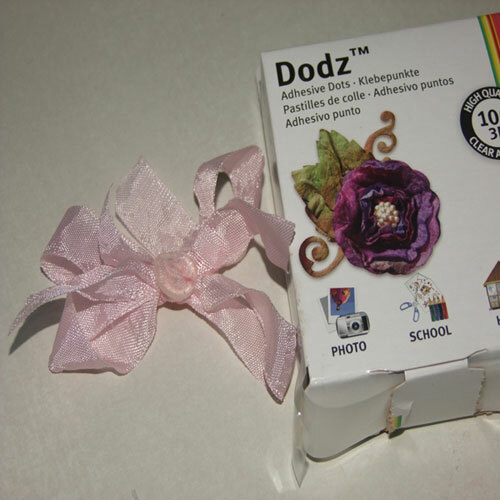 As the doily is quite a thin paper the E-Z Runner Permanent Fine Adhesive is a much finer, lighter texture tape so it won’t show through the paper of the doily. 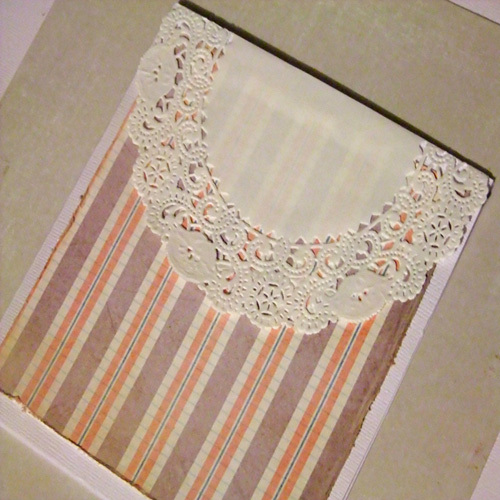 Stick the notecard top/centre of doily with about 1/4 overlapping the top edge. 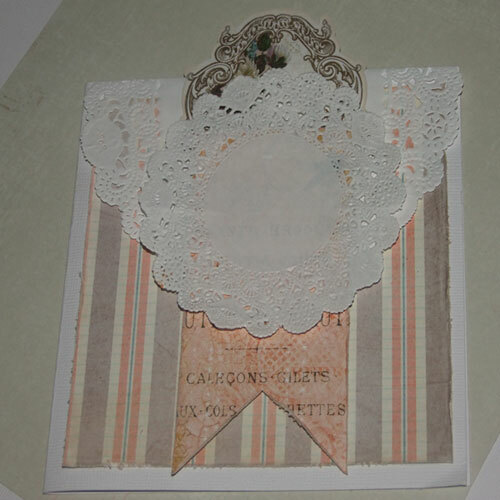 Once the chipboard piece has been fussy cut the image is very delicate with very thin areas. 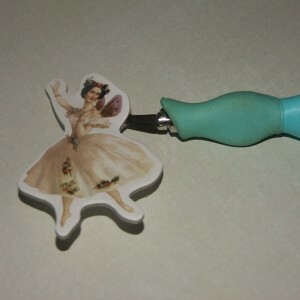 It is quite hard to stick down so I find this the most effective way. 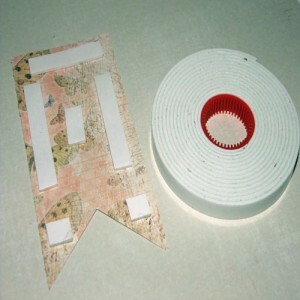 Use Adhesive Sheet 6″X4″/10CMX15CM. Take 1 sheet & cut in half. 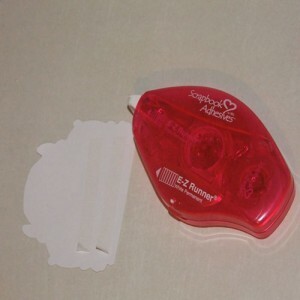 Remove yellow release liner. 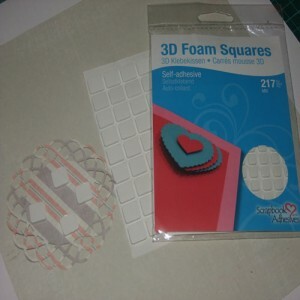 Stick the chipboard piece down (good side facing up). 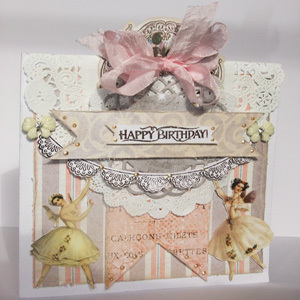 Fussy cut around the chipboard image. 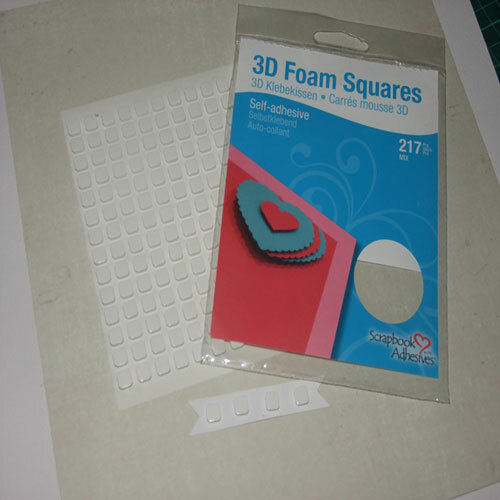 The Adhesive sheet now fully covers the chipboard piece even in the tiny intricate places! 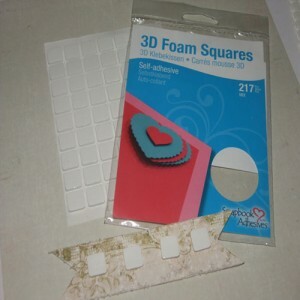 This entry was posted in 3D Foam Squares, Adhesive Dots & Lines, Adhesive Sheets, Adhesives, Cards, Crafts & Tutorials, Crafty Foam Tape, E-Z Runner® Dispensers, Permanent Adhesive, Tutorial and tagged 3D Foam Squares Mix White, Adhesive Dots 3D, Adhesive Dots Medium, Adhesive Sheets 4x6", Birthday, Crafty Foam Tape White, E-Z Runner Permanent Fine, E-Z Runner Permanent Strips Refillable, Jenni Bowlin, JustRite Papercraft, Megs Garden, Prima Marketing, Ranger Ink, Shell Carman. Bookmark the permalink. One Response to "Shabby Chic Happy Birthday Card Tutorial"
A Beautiful card, Shell! And you really make all that adhesive work for you!